Russian author Fyodor Dostoevsky is one of the prime influences in my life--his novels grabbed me by the collar and shook me to the core when I was around the age of 20. This was a quick, but effective, depiction of him as an owl--it worked surprisingly well. This piece was satisfying in it's use of line rather than dots, (for the most part) in shading and texture. 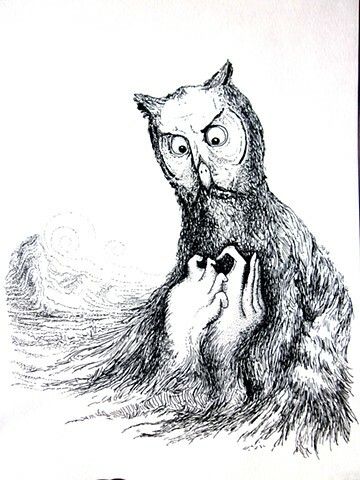 It really looks more like an owl, but it was directly referenced from a Dostoevsky pic I've had forever that usually is pinned to my wall.